I packed light. Or at least I thought I did, until I met Ida (a fantastic woman and fellow sketch artist). Ever since joining forces for a couple of weeks wandering and painting Turkey together I have been shedding weight – from my pack at least – trying to pare down to virtually less than the essentials. A woman’s gotta have her priorities. 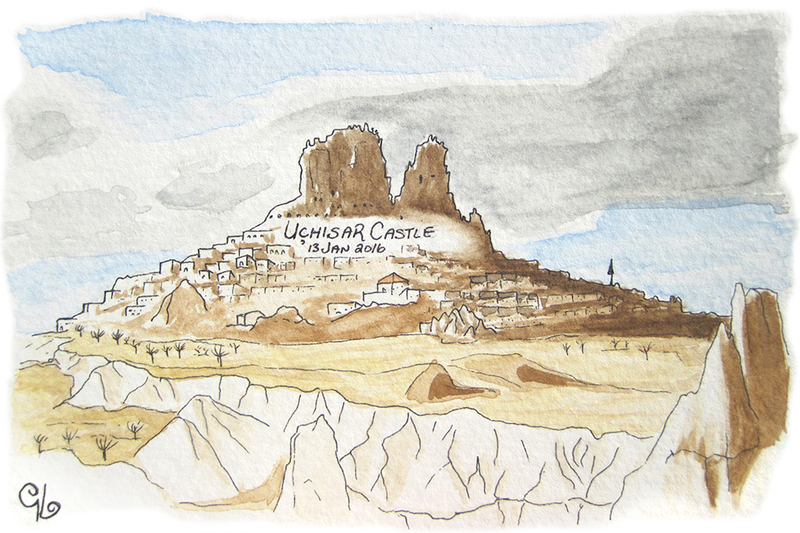 One day the choice came down to my running shoes and extra pad of watercolour paper. As my gaze landed on the paper I made myself a promise: I will do more yoga to make up for cutting out jogging, and I will paint more to justify the paper. Travelling with another sketch artist was just the kick in the rear my artistic motivation needed. We wandered cities, crossroads, shorelines, countrysides, eyes keen for that perfect framing. Turkey did not disappoint. 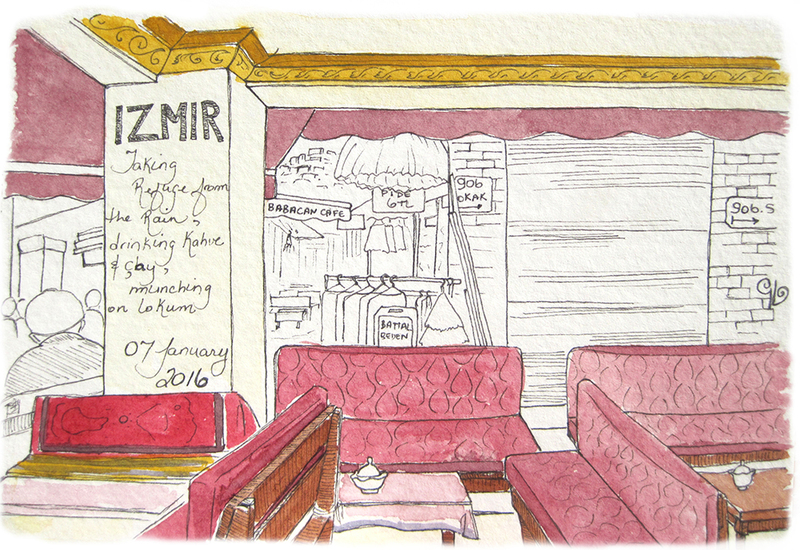 A rainy day in Izmir is the perfect excuse for spending two hours cupping hot çay in one hand, paintbrush poised in the other, absorbing the details of the alleys surrounding the Kizlaragasi Han Bazaar. We were not being lazy, we were working. Honest. We were introduced to a gem of a local haunt: a barebones cafe at the end of a local fishermen’s wharf. 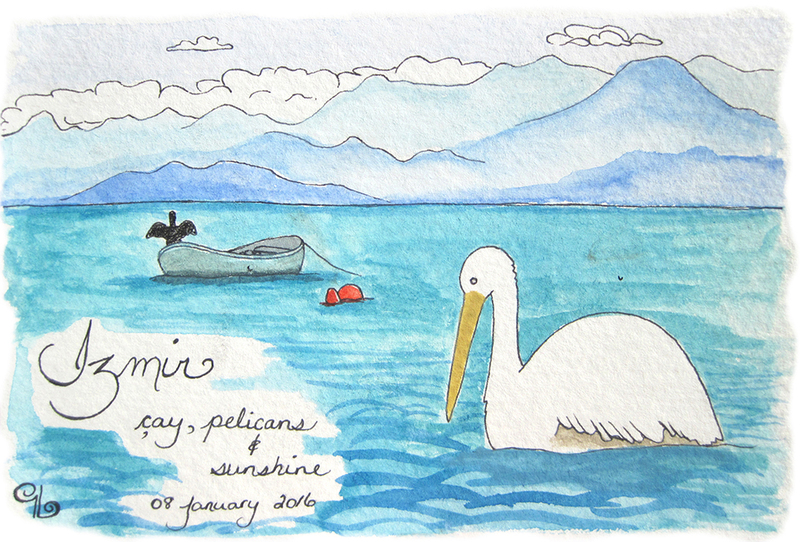 Pelicans and dinghies bobbing in the tide. Cats and seagulls eager to pounce and swoop down for morsels of cheesy pastries offered by patrons as much for the amusement of watching the ensuing cacophony as for sharing sustenance. The distant mountains shrouded in a mixture of salty sea air and city generated smog, I tried twice to capture how the peaks faded into the distance. 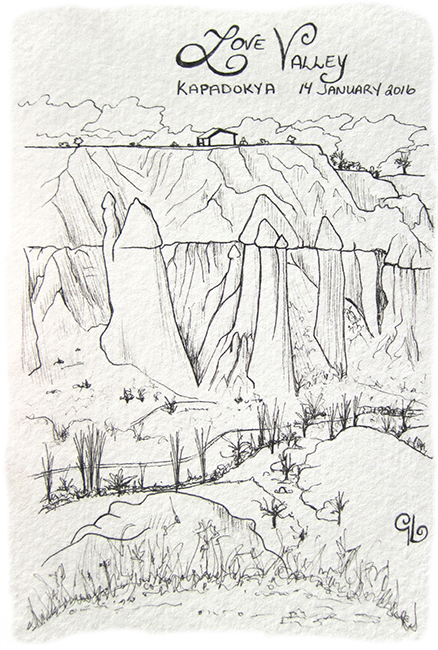 The ridges, valleys, human carved caverns and castles of Cappadocia kept us busy with long walks from one postcard to the next. We became absorbed in the landscape, only coming to our senses when fingers began to slow, stiff from the cold. We lucked out, a week before our visit temperatures had plummeted far under zero. I am glad my toughness was not measured by a yard stick in the form of a thermometer with the mercury line sitting at minus 20 degrees. Do you see the … mushrooms? The Kızılırmak (Red River – so called for the clay that used to be drawn from its bed for the local ceramic industry), currently home to a gazillion geese. A gazillion mean, incredibly loud, insatiably hungry geese. I have never been more happy for the existence of a fence between myself and a body of water before. 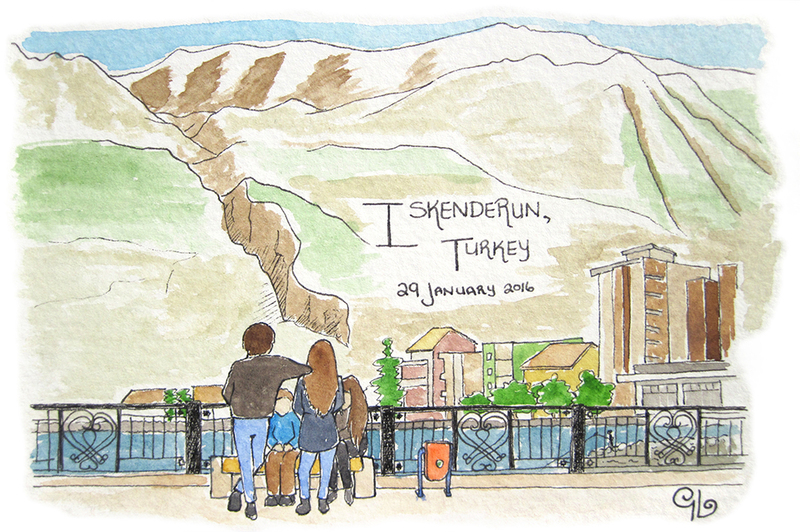 I found myself in Iskenderun, stubbornly (so I have been told – nah, not me!) trying to find a boat to Israel. No boat, but a beautiful setting that called brush to paper from almost the first moment I arrived. 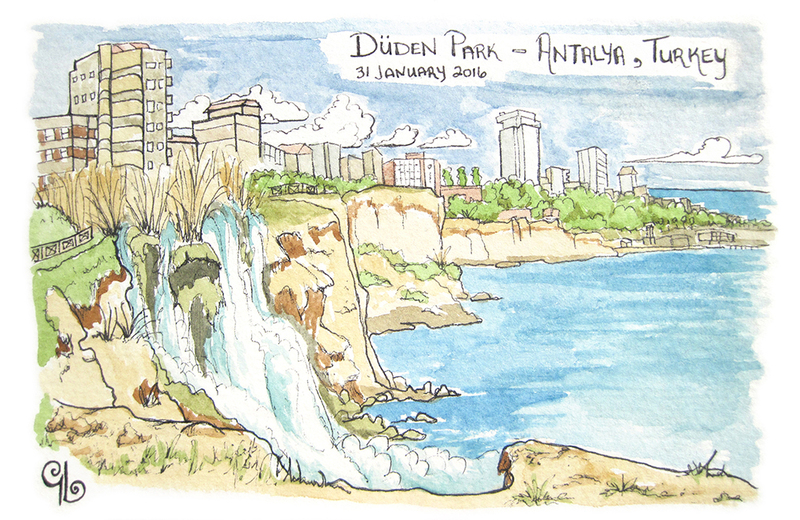 Antalya graced me with perfect weather paired with stunning seaside views, orchestrating a beautiful afternoon of painting and wandering alongside cliffs. 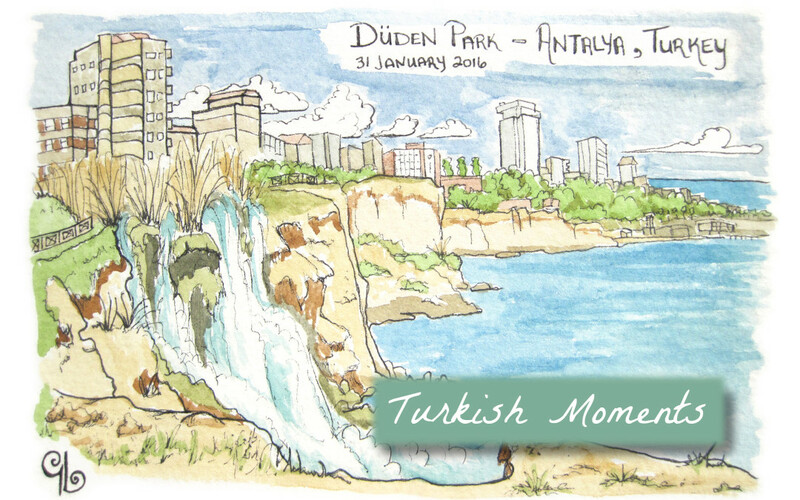 She may have won the title of favourite city in Turkey, but let’s keep that our little secret. I do not want to hurt the other cities’ feelings. 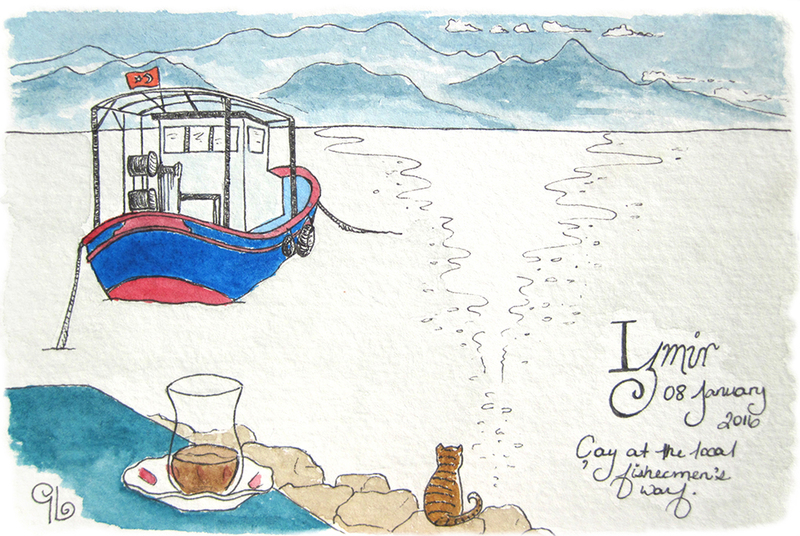 Men hang out in companionable groups everywhere in Turkey, gossiping while nursing glass cups of çay. I walked past this lot early one day, smiling and thinking to myself that it was a shame I had somewhere else to be. 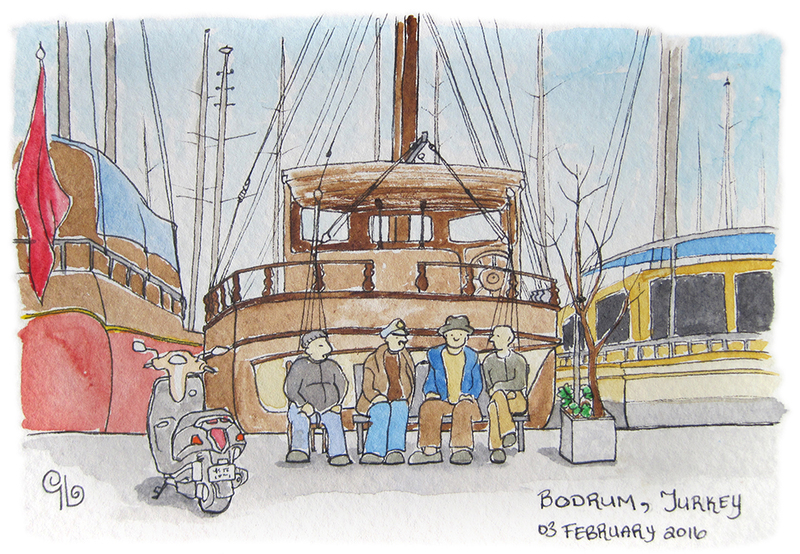 Three hours later I decide to come back to sketch the lines of boats in the marina. Yup, the same old farts were sitting in front of the same ship. That is ten less pieces of paper, all about to receive stamps and sent to various parts of the world. At least half of the bargain between me and my running shoes has been fulfilled. Now for a few down-dogs. You’ve created a pictorial book of your travels in Turkey. perhaps you can have them printed and copied to put up for sale in the touristy parts of Turkey. Lovely. Hello Anne. Thank you for you kind words. All the best, Genevieve. I stumbled across your blog via stumbling across Candace Rose Rardon’s on WordPress this morning. I love Turkey and long to return. 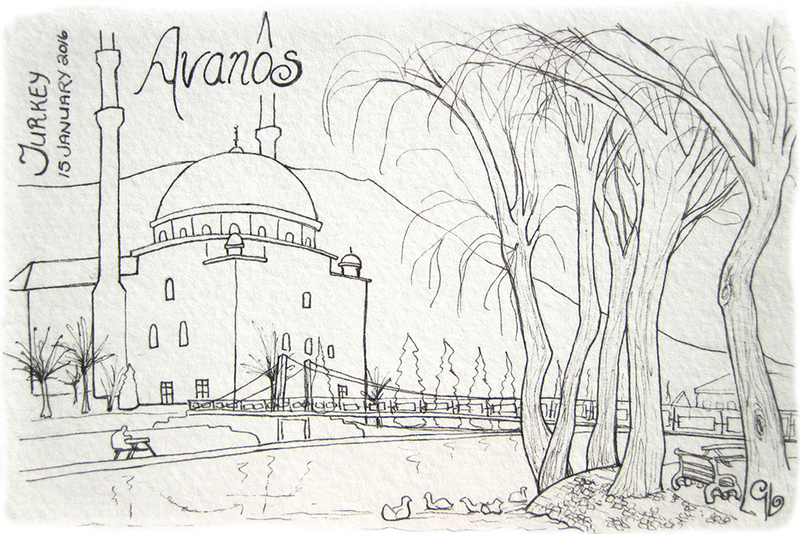 Your sketches are sublime in their simplicity and certainly evoke memories for me even though I haven’t been to all the places you have sketched. 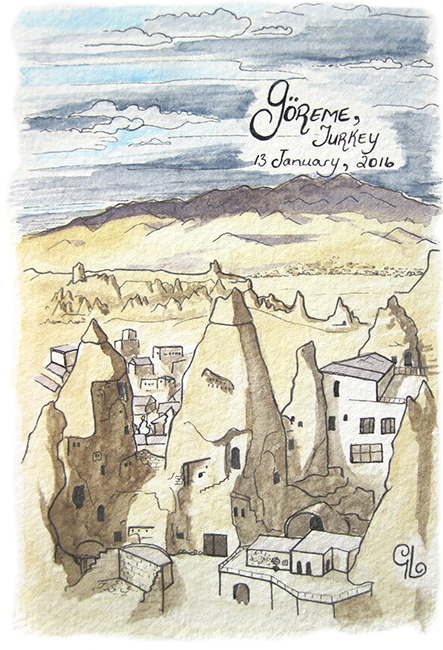 I have chronicled my journey through Turkey over several posts because I cannot draw to save my life but I am intrigued by those who can. I’d love it if you’d take a look at my journey through Turkey one day. Hello fellow Genevieve! Thank you for introducing yourself. Your description of the bus ride from Istanbul to Thessaloniki brings back memories, such a great recounting of what those overnight long hauls are like. I am happy to hear through your words the same kind of charm I felt while in Turkey, and am busily reading through other posts on your blog. Happy travels!